Located in the centre of Castelluzzo (TP), a hamlet near San Vito Lo Capo, our Bed and Breakfast stands just a short distance from the wonderful pristine coast called Baia Santa Margherita (St. Margareth Bay). Characterized by crystal-clear waters where to plunge in, the coastal landscape is of in-comparable beauty. On the eastern side it extends on the cliffs of Cala Mancina whereas on the western side it rises up in the promontory of Mount Cofano, where breathtaking sunsets can be admired. A stretch of coastline preserved by real estate developments, a “small paradise” where the sea takes various shades of blue. This is the ideal destination for a secluded tourism, away from the crowded beaches, to the discovery of coves, inlets and corners of this stunning sea where the unspoilt nature, with its scents and colours, can be fully enjoyed. 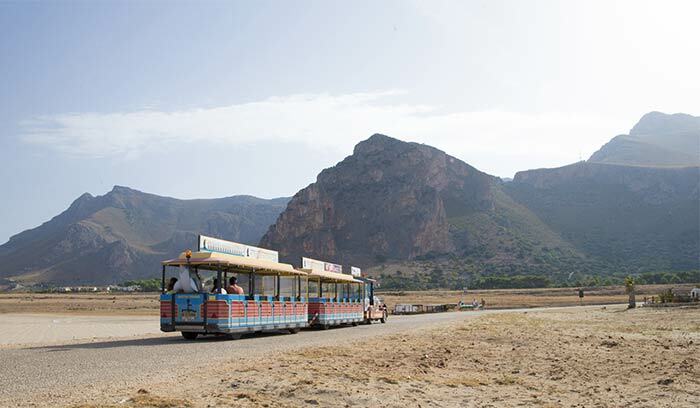 In summer the coast can be reached by using a free shuttle service (called “Trenino Ercolino”): an eco-sustainable way of living and supporting this wonderful mix of sea and nature. From 1st June to 30th September, the road to Baia Santa Margherita (St. Margareth Bay) is closed to traffic from 8,30am to 8,30pm and those who want get to the bathing areas can leave their cars in the free parking areas of Macari and/or Castelluzzo.